Now…what? Well, we know your head is probably spinning with all the details of planning your big day: What venue will you choose? Should you have a theme? What date will work best? What about colors? And most importantly, what about your dress? Where will you find your perfect dress?! Our advice? First, slow down and take a nice, long, deep breath. (Seriously, take one. You’ll feel much better.) Now, clear your mind of all stereotypes about shopping for your wedding dress. Shouldn’t this wedding dress journey be all about you? 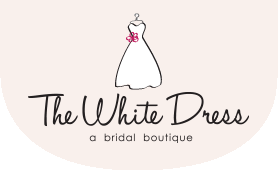 That is where The White Dress comes in – the perfect boutique to find your perfect dress, plain and simple. So stop reading and schedule your visit already! Then you can have fun exploring the rest of The White Dress’s online world to find out what makes us so special. Download our Wedding Dress Appointment Guide!